Preparing a vacant home is more than just making sure that the property is clean.Â It goes beyond cleanliness.Â If there are competing homes in your neighborhood, this is just another way for you to stand above them all. 1. Curb Appeal – The first thing the buyer sees is the curb appeal.Â I even knew of a buyer who would not even go in a house because of the lack of curb appeal.Â It was a great house inside but could not get him in the door. – Make sure your bushes are under control and trimmed, pull weeds, and even add some new mulch if needed. – Your front door should be clean.Â Even repainted it, first impressions are important. – Add some plants that give color.Â It will ad some punch to the landscape. 2. Cleaning – don’t stress out your buyer’s, have a clean house. – Clean the driveway and sidewalks. Try using a pressure washer. – Make sure windows are clean inside and out. – Clean your decks and patios with a pressure washer. 3.Â Make sure you have neutral colors.Â While your red wall may be your favorite, buyers react better to walls that will fit with their decor.Â If they have to repaint that makes the home more work.Â Try creams or light grays. 4.Â If your house is vacant the buyers eyes will go right to the carpet.Â Not to mention buyers see it is unsanitary.Â Replace with an low cost neutral tone. 5.Â If you can, stage your home.Â Give the buyer something else to look at besides floors, walls and ceilings.Â They will not be able to see the flaws as easily.Â If they see flaws, they are more likely to make a lower offer. I have the room for a garden in my yard but circumstances have not permitted me to plunge into the full fledged project of a garden.Â Every year, I say next year.Â Well, this time it came and went.Â Last year was the first time ever that I got some vegetable plants and put them in pots.Â I had bought some on clearance and brought them back to life.Â They did well.Â I had peppers and tomatoes and tomatoes on my back steps. Well, I also enjoy feeding the birds and keep a feeder about 10 feet from the back door.Â Sometimes I would put some birdseed on the back step and the birds would come to the step.Â Well, Mr. Chippy would also come by and sit and pack his cheeks. So one day last summer,Â I checked on my tomatoes and went back to my office to work, then came back down to the kitchen to get something to eat at lunchtime and noticed that ALL my 9 cherry tomatoes were gone.Â I blinked my eyes to see if I was seeing things.Â I could not believe it.Â Where did they go?Â There was not trace of foul play and none rolling down the back steps.Â How could this be?Â And in broad daylight? I was baffled for the rest of the day.Â I told a friend what had happened (one who is an avid gardener) and he was not sure what would have done that.Â I had ruled out raccoon or deer and even opossum.Â My gardener friend said a chipmunk or squirrel would probably never do that. So the next day, I go to the window about to check on the remaining peppers I have left and what do you think I saw?Â Mr. Chippy sitting there on the bottom step eating a cherry tomato.Â He saw me and dropped the half eaten tomato and ran.Â It appeared he picked them all and stashed them under the bottom step to eat at his leisure.Â I was growing these cherry tomatoes for my daughter, as she loves them. That was not the last of him either.Â I had run out of birdseed so one day right in front of me, Mr. Chippy jumped in the top pot by the back door and started gnawing on my pepper plant.Â I am pleased to say he did not get any of them. 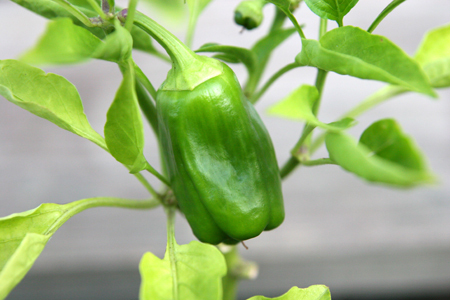 This year I have scaled back on the birdseed and have not seen too much of Mr. Chippy.Â I have a few peppers and none that I know of have mysteriously disappeared.Â One pepper ripened and my daughter was happy to have me cook it up in an omelet for her.Â Â Â Hopefully we will get the remaining few peppers and next year try to for the bigger garden.Â Having a bigger garden will be a challenge with all the crazy critters in the yard. 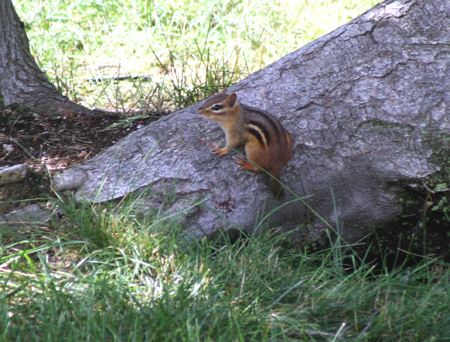 Here is a photo of Mr. Chippy in my yard and of one of my baby green peppers this year. As we discussed previously the Pittsburgh Region is one of the top in the country according to Forbes magazine.Â The prices have not been to low or too high and have remained steady.Â It still is currently a buyer’s market as there is a lot of inventory.Â If you have your home listed, be competitive.Â SometimesÂ you will be in a neighborhood that has other homes very similar in price and quality.Â What you need to do is make your home stand out to the agent and the buyer.Â I have my own suggested incentives.Â Maybe your agent has some too.Â You need to stand out to get things moving.Â Be creative! You know one fun thing that I did as a child growing up in New Jersey was pick blueberries.Â My mom would take me and my sister out once a year as I remember to a farm to pick them.Â We would get a metal coffee can that had holes in it so a rope could be strung through it.Â We would then tie the cans to our waist.Â Of course, we would eat some while we picked.Â When I got married and settled in Western Pennsylvania, I wanted to do the same for my kids.Â I had trouble finding a blueberry farm for many years – maybe I did not look hard enough.Â So one day I was out running some errands and came across a sign to pick blueberries.Â It was only about 20 minutes away.Â I immediately made plans to head out.Â I brought the kids, Mom, and the cousins, and friends.Â We have enough to last us a couple of years in the freezer.Â The place we went was S. K. Berry Farm in Sarver, PA – right on Rt 356.Â Last year they had limited berries, maybe due to the weather but I am looking forward to picking as this is the time of the year.Â Blueberries are actually great for your health – a great snack by themselves.Â I love the big sweet ones. Speaking of young first time home buyers, I have had one couple buy the first house they ever looked at and love it.Â I had another young couple who always had trouble because the home was never up to par or a steal of a deal.Â Be patient and don’t be too picky no house is going to be everythingÂ you want.Â Even if you have the opportunity to purchase a new construction home, you still have to change things to make it your own.Â If you wait for the “right” house, it may or may not ever come based on your own ideals.Â And if you really think you have found the right house, jump on it, it won’t last long.Â Believe me, I have seen houses go fast many times. Digging Through Archives – Cows? I was working on a project yesterday while looking through some home photos. This search brought back some interesting memories. I was lucky enough to be one of the first to move into my housing plan. Some may not think that is so lucky though. I had to deal with a lot of construction noise for a while but it was fun to see other homes around me be built. I have been where I am now for about 5 years. As you know, if you have read some of my previous entries, I have run into some interesting creatures – some quite unexpected and still new ones keep popping into my yard. One funny story that I have has since been forgotten. 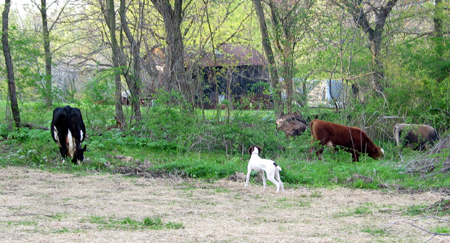 When we first moved in, my neighbors and I would have cow sightings. Not usually one cow but a few. The neighborhood is near some large plots of property. Apparently a local farmer was not too disciplined with keeping his cows in check. The cows would get out and roam the neighborhood. It seemed that the local policemen were in the area regularly to round up this heard of cows. One early morning the cows had come through, so the neighbors had informed me. I had not had the chance to see them, but went out front to take the kids to the bus stop and noticed four of my flower pots going down the steps to the driveway were knocked over and cow footprints across my driveway. I was fortunate to not have any lawn damage or have my flowers eaten, but some other neighbors had big prints in their yards and maybe a few other surprises. 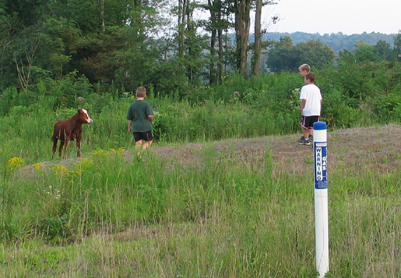 Anyway, here is a photo from 8-1-04 of a baby cow with My son and his friends. 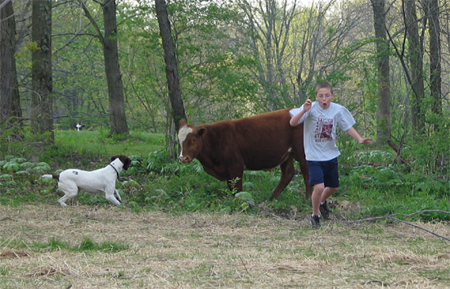 This is from when a small herd of cows came wondering through my next door neighbor’s backyard one afternoon.Â My son was talking to the cow and the cow started coming over to him so he ran.Â At this point the cows were still getting out and had come to drink in a small stream.Â Â A local resident hunting dog came over to take control. The cow problem seemed to stop not too long after this day.Â Rumor had it that the local police decided they wanted to be paid if they had to be cowboys. Have gas prices gotten to you?Â They have effected everyone in some way.Â People who work very near or at home really do have it better.Â Some have even given up their SUV’s they have had for years for the compact car.Â Have your heard of the gas card deal from Chrysler and Jeep ( The $2.99 gas guarantee)Â – not a bad deal if gas is $4 or $5 or more. Here you will find tips for upping your gas mileage.Â It can be anything from tire pressure to lightening the load with things we store in our trunks.Â How do you improve your mileage and reduce costs? I was talking with a neighbor in the last couple weeks and lo and behold I can add another creature to the neighborhood list.Â Unfortunately, I do not have a photo as I have not seen it for myself.Â My neighbor has a few cats and leaves her garage door open enough for them to come in and eat.Â Well one day she went into the garage and there was her friendly skunk chowing down on the cat food.Â I am sure he is not the only creature to come by for the tasty cat food.